Though still performed in his native Russia and all over YouTube, Anton Rubinstein must be one of our era’s more unjustly neglected composers. Prolific in every genre, and immortalized as a conservatory (as was his brother, Nikolai), he has nearly disappeared from the concert stage in America, God help us. Take his Fourth Piano Concerto as one example. George Henschel debuted it with Boston Symphony in Season II, 1882, 11 years after its birth. Its 55th performance with the Symphony came in 1947, after it had been demoted to the Pops. Since then, Rubinstein has sunk into BSO oblivion like a heavy ruby waiting to be mined again. Listen to what the Boston Pops sounded like in Victor Herbert’s arrangement of one of the composer’s solo piano gems [HERE]. Consider the most famous song, “Es blinkt der Tau” HERE. And there is plenty of fine chamber music. Among his 20 or so works for the stage, only the opera The Demon has retained a secure position in the repertoire of his native land, and not anywhere else. Yet it may be on the cusp of rediscovery in the West, in large part because of how Rubinstein’s lyric gifts serve characters and audience well. 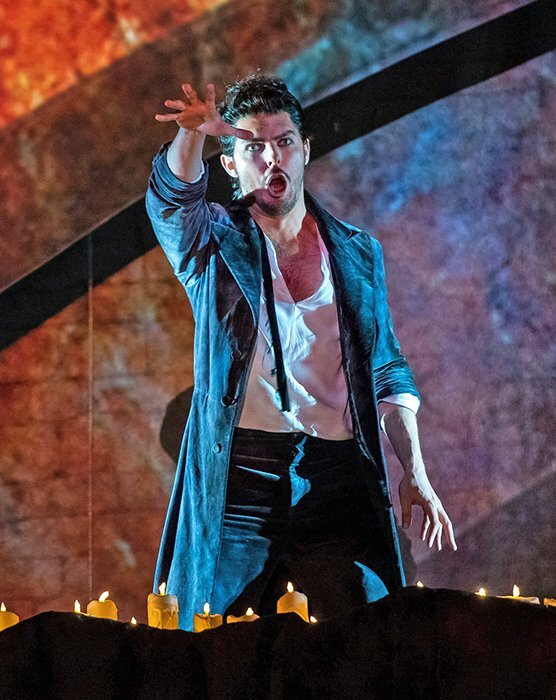 Boston’s Commonwealth Lyric Theater, in a vivid if truncated production (which kept the titulairesinging from offstage until the final act), gave Boston’s first staging in over 100 years, in 2017 [our review citing “the best Demon you will ever hear” is HERE]. The late Dmitri Hvorostovsky [HERE] and Nikolai Ghiarov [HERE] were perhaps the most celebrated singers to take on the role since Chaliapin. This week at Bard’s Gehry-designed Sosnoff Theater, composer-lifeguard extraordinaire and artistic director (and college president) Leon Boststein, made a convincing case for returning The Demon to its rightful position in the dramatic canon. Enclosed in something of a convoluted metallic winged victory, the Sosnoff Theater contains a moderate-sized poured-concrete auditorium completely at odds visually with the sculptural outer shell. Above a steeply raked floor, two blond-wood-faced wraparound balconies, a series of large half-cylinder blond-wood sound diffusers, and some decorative wooden curlicues appended to the walls soften the effect of the smooth concrete. From the very comfortable seats, upholstered with names of contributors, one can see and hear quite well. The sound is articulate, but with plenty of bass support. The volume of sound from the nearly 60-strong American Symphony Orchestra in the capacious pit bloomed sonorously in Rubinstein’s swirling (recurring) prologue, as Botstein started at a stately tempo before alternating accelerandos and relaxations. Throughout the show the pit emitted subtle, accurate and clean sound, if a bit short of the grittiness, agitation, urgency, and drive that this relic needs to snap and snarl. Paul Tate dePoo III designed a deeply three-dimensional unit set of concentric receding arches which received Greg Emetaz’s gorgeous and evocative projections, still and moving, with unusual grace. 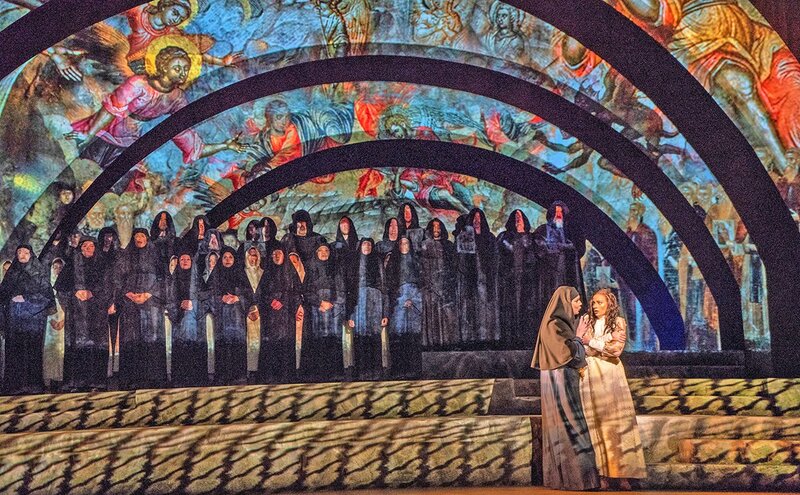 Effective masking of the images and JAX Messenger’s emotionally apt lighting (including three follow spots) prevented washout of the projected graphics, allowing the arches to take on stormy dæmonic qualities and also summon Russian icons. 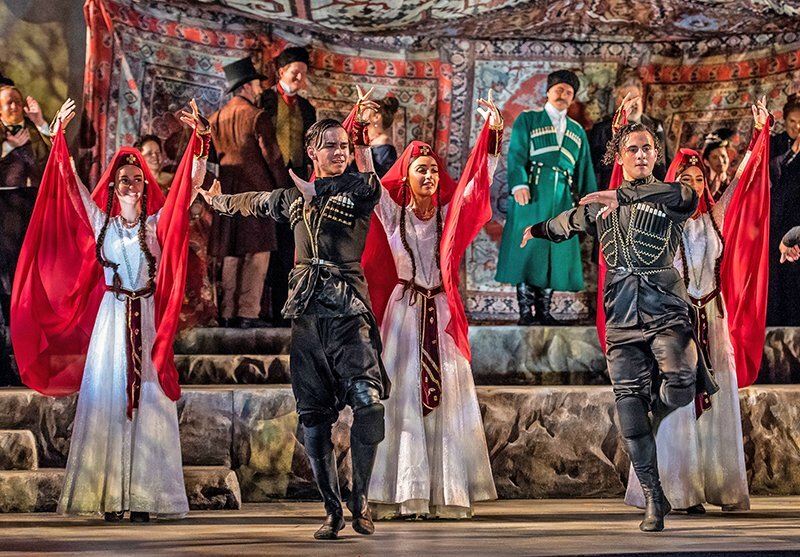 The integration of set, projections, and lighting achieved signal success in melding these arts. However, a Taco Bell-like structure of convent cells topped with Christmas lights made jarring rolling intrusions and exits. From the atelier of Kaye Voyce, vivid costumes (for the principals), detailed and individualized, satisfied the critical eye except for the unfortunate dressing of the Demon as a male model in a cologne or watch ad. Though he wore a 19th-century frock coat, his open shirt, dangling skinny tie, and three-day-old beard made him too contemporary. The character was further hamstrung by how director Thaddeus Strassberger equipped him with a limited vocabulary of gestures. We got tired of seeing his spread-finger marionette string-pulling; it wasn’t necessary to belabor the point that the Demon controls the characters. In a generally satisfying period-true production with plenty of purposeful movement and effective interaction of personae, Strassberger took some liberties that may not have worked. Opening with a convent scene that normally comes later in the opera makes what follows largely a flashback of the dead Princess Tamara. For those who don’t know the story, the arrival of a bier is meaningless. It also interrupts the dramatic flow and eliminates the surprise of the characters at the cruelly truncated wedding scene. We also didn’t care for the virginal princess’s propensity to sit astride Prince Sinodal (in a directorial fantasy) or hump the demon in similar manner when Lermontov’s poem calls for a single fatal, if extremely passionate, kiss. Could we have had a bit more swordfighting when Sindal’s army is ambushed? The convent on wheels obscured the scene way too soon, though we liked the silhouettes of Nordic horns on the helmets of the enemies. Strassberger had the old servant-gravedigger commit an unfortunate howler by tossing a dummy corpse of the princess into the grave he had dug in a stage trap. This enabled Princess Tamar to pop up reincarnated to bury herself with real dirt. Hmm.… Lermontov makes much more of the funeral and burial. And did sisters writhe in their cells à la Ken Russell’s The Devils because the Demon possessed all of them? True, the seraphic angel had left the scene, so they potentially had become #MeToo prey. Gripes aside, this show mostly did justice to friend Anton. Tenor Alexander Nestorenko brought down the house in Sinodal’s death aria, the only one interrupted by applause. What a pity Rubinstein gave us no more opportunity to hear this brave and lustrous sound. Olga Tolknit endowed Tamara with sometimes overpowering metal. She could certainly ride the orchestra, and her penetrating scream raised high the competitive bar. As old father Gudal, Andrey Valentii rolled out fine bass tones and embraced the dignity and sorrow of the stricken man. The angel with beautifully enhanced projected wings was warmly voiced by Nadezhda Babintseva, consoling all. The nanny, the old servant and, the messenger—Ektarina Egorava, Yakov Strizhak, and Pavel Suliandziga—made strong contributions. With flair and commitment, gorgeous projections, a colorful Caucasian wedding canopy; spark-striking acrobatic swordplay and gliding damsels of the Pesvebi Georgian Dancers; and generally fine singing, Botstein and his marvelous minions resurrected the swirling, fantastic world of Rubinstein’s dæmonic and demonstrative Demon back to vivid life upon the wicked stage. Bravo; Браво. The run continues on Friday and Saturday at 2:00. fishercenter.bard.edu.